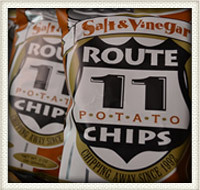 A few years ago Route 11 fired up their first little cooker and started making chips in an old feedstore in northern Virginia. Their original quest was to pay tribute to the most popular snack food in the USA by just trying to make an excellent potato chip. Their recipe is simple: good potatoes, high quality oil, and unusually delicious seasonings. It’s amazing that something so simple can be so good! Route 11 is still small potatoes but that’s how they like it. Their small size affords a chipper attention to detail, turning what is usually mass produced by machines into a fine art. Try ‘em…you’ll be back. Everything we ship is freshly made. Shelf life of all potato chips: approximately 4-6 months. Shelf life of mixed vegetable chips: approximately 3 months. All bags code dated with expiration. We do not take back out-of-date product. Keep chips no warmer than room temperature. Do not expose bags or containers to direct sunlight. Prices are FOB Mount Jackson, Va. via UPS or requested carrier. All orders must be prepaid. VISA, Mastercard, American Express, and Discovery accepted. Terms available with credit approval. Virginia customers must include sales tax exemption form. 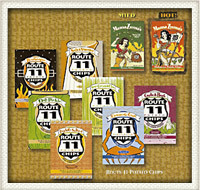 See how the best potato chip in the world is made!